This post covers two webinars. A Serendipity session in which we shared and discussed our infographic “homework” from the previous session and a FineFocus discussion session about what makes “good” presentations. This recorded session was a Serendipity (unconference) session with a difference as it continued the theme from the previous session. We shared our “homework” infographics resulting from the previous session and found that most of us experienced a degree of frustration with the infographic tools such that some of us had not used the online tools. 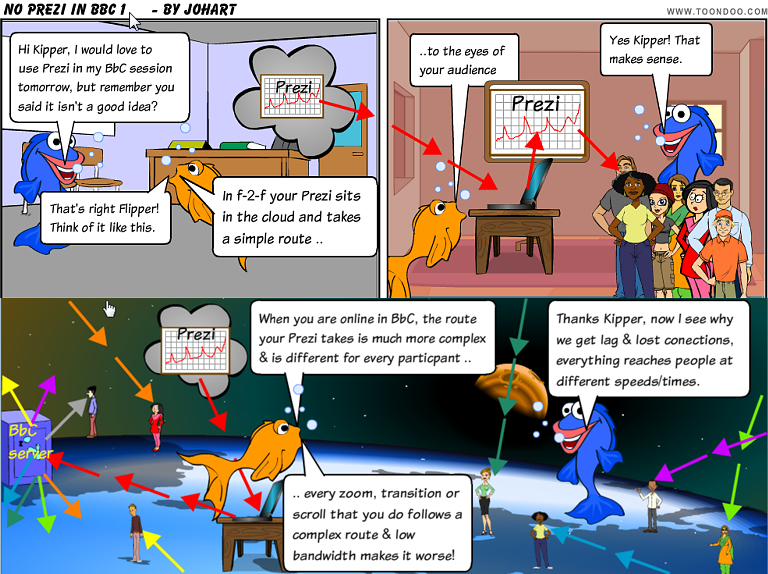 @jofrei picked up on a need expressed in the FineFocus session and has created a visual for one of our participants in the USA – Jo has posted about this. 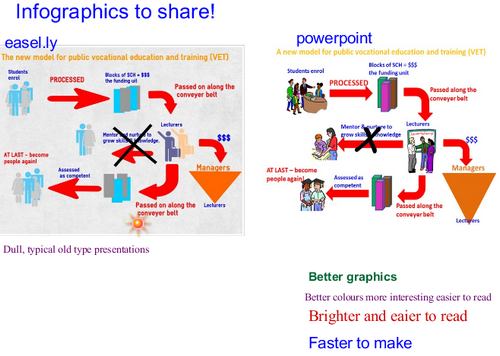 In my case I did two infographics one with one of the tools we experimented with and one with Powerpoint! I put my two infographics on the screen WITHOUT labels for the tools I had used and asked the group for comments/preference. The one made with Powerpoint was preferred. This one was quicker and easier for me to make partly because I am very familiar with Powerpoint. However I did find that consistently selecting and moving shapes in the other application was much more difficult. The discussion moved on to consider whether the proliferation of tools available for very specific tasks is necessarily a good thing, especially when there are more general tools that can be used very effectively. My personal thoughts on this are that the choice can perhaps be bewildering for those relatively new to e-tools, and can also sometimes produce a tendency to use the tech for techs sake. I feel it is important to remember that the “best” tool for a task is not necessarily the newest and trendiest but the one that suits the user best. I now realise that the reason I had not used infographic generators previously is that I don’t need them as I can create better ones with tools I already use. Of course this may change – we live in an era of rapid change so I could feel quite differently in a year’s time. 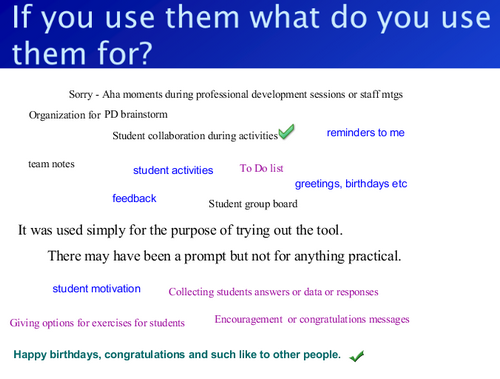 This recorded session was one that arose from some comments in the Serendipity session above relating to appropriate tools for tasks. On this occasion we had a structured discussion about what makes “good” presentations and whether this varies with the purpose and audience. FineFocus discussions are differentiated from those we have in Serendipity sessions by the fact that they are structured in advance and that we often use pre-prepared stimulus questions and/or resources. Ideas flew thick and fast on the whiteboards and in text chat and audio. 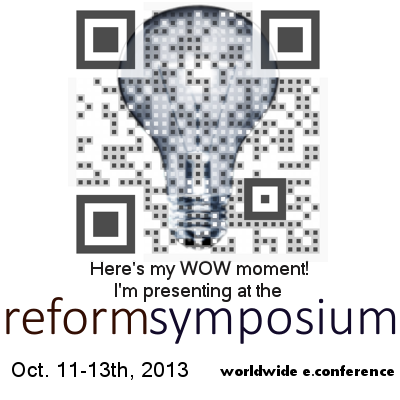 Presentations in one form or another are something that we, as educators, do all the time. 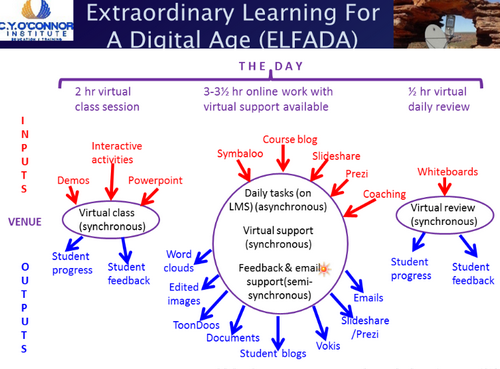 Using e-tools and strategies adds a new dimension and perhaps can help us to avoid a “death by ….” with whichever presentation tool we are using. 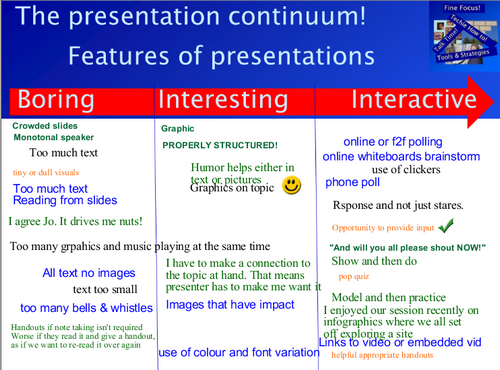 We should always remember it isn’t the fault of the tool if we do a boring presentation! Two lively sessions! 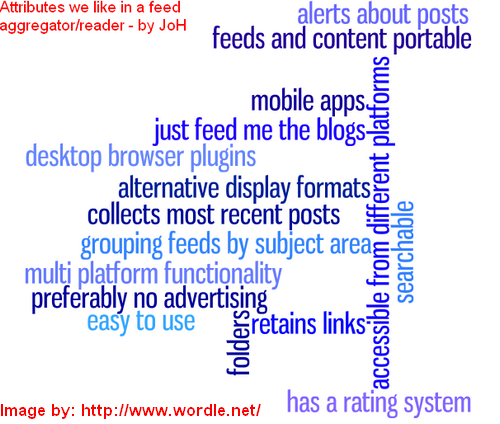 Lots of ideas links and interactivity.